We checked out the impenetrable Kraken A.M.S. 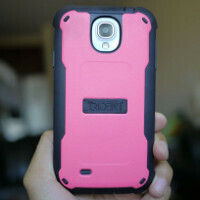 first, then the lighter Aegis case, but for this last effort, the Trident Cyclops case for the Samsung Galaxy S4 aims to fit right in between its close siblings. Naturally, when one case is too big, and the other just too small, you always need to have one that’s perfectly in that middle position of being “just right” – so that’s where the Trident Cyclops case finds itself. Just like the previous cases we scoped out from Trident’s camp, the Cyclops case has that rugged construction to give it ample protection against some harsh punishment. In fact, it meets military standard 810F for protection against vibration, sand, dust, rain, and drops. Looking at the design, there’s no arguing it’s a beefy thing that encases the smartphone properly – though, the pink on black color scheme does sprinkle a little bit of character to it. With the rubbery sidings of the case, it helps to deflect shock when it’s dropped from a maximum height of 4 feet. Meanwhile, the plastic film on the front allows it to deflect some splashes of water, but it’s not totally waterproof. Fittingly enough, the Trident Cyclops case for the Galaxy S4 is priced almost snugly in between its siblings at $39.95 – whereas the Kraken A.M.S. and Aegis cases are priced respectively at $50 and $35. Therefore, if you don’t need the rock solid protection of the Kraken A.M.S., but still want something more than the Aegis, the Cyclops is going to be the perfect fit.